There are a lot of cigars out there, and the best tutorial you can get is to walk into a tobacco shop and let the staff give you a tour. Stick with hand-rolled over machine-made cigars. Start with mild to medium smokes; no point in heading right to robust maduros unless you like breaking out in sweats. Rule 1: Never bite off the end of a cigar. The cap end, the end right above the band, is where you want to make a small sliver of a cut. Best way to do this is to put the cap end in a cigar cutter placed on a flat surface. Some prefer a cigar punch. Lacking either, we’ve been known to slowly insert a golf tee in the cap end for few moments, then remove and light up. You don’t want to be puffing on fire. It’s best to toast the cigar first by holding your flame — preferably from a butane lighter or wooden match — close to but not touching the cigar. Rotate until the end is evenly glowing, and then you’re on your way. Take your time. Puffing away like mad will make any cigar taste harsher. The best thing about a cigar is its pleasantly enforced leisure. Roll the smoke around on your palate a bit before lightly blowing it out. And need we say — don’t inhale. Leave on or remove? There are two camps that swirl around this perennial question, and neither is right or wrong. We like leaving the band on for the first half of the smoke to avoid possible wrapper tears, but then removing it to avoid burning the band if we’re going all the way with the stick. Naturally, we recommend a few sips of whiskey between puffs. 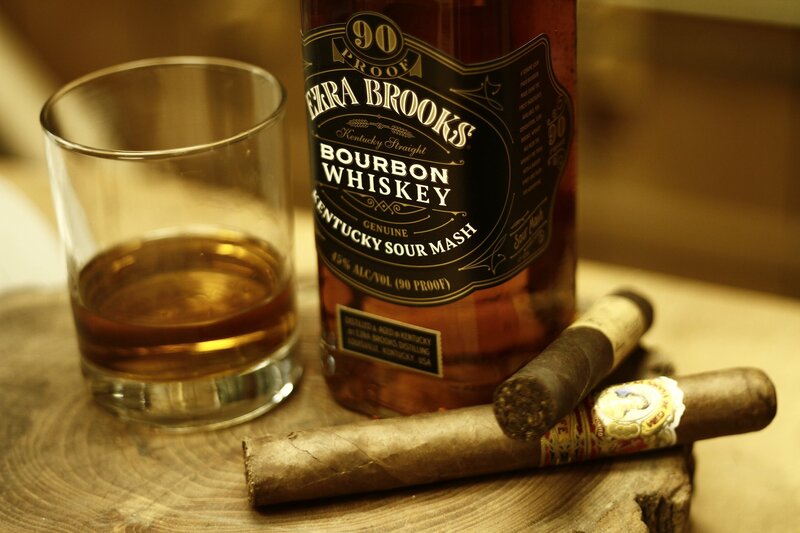 But you must pair wisely to really enjoy the flavors of both the cigar and your whiskey. With the woody and cinnamon warmth of Old Ezra, for example, a Sobremesa Short Churchill from Dunbarton Tobacco ($11.25 for one) will fit the bill, with its earthy sweetness and notes of nougat and cedar. The spicy grains of the Ezra Brooks Straight Rye Whiskey should complement the peppery notes of a Diamond Crown Natural Figurado No. 6 from J.C. Newman Cigars ($100 for a set of five). Look to both for sensations of vanilla, oak, and leather. And with the Ezra Brooks Kentucky Straight Bourbon, try something a little out of left field: a Fox & Hound from Durango Pipe Tobacco Cigars ($17 for two). The caramel and vanilla notes from the bourbon will echo the aromas from the tobacco, actually aged on vanilla beans.